Preface. 1.Introduction. 2. Towards Guidelines of Environmental Scenario Analysis. 3. Environmental Scenarios. A Survey. 4. Searching for the Future of Land: Scenarios from the Local to Global Scale. 5. Participation in Building Environmental Scenarios. 6. Combining Qualitative and Quantitative Scenarios of the Environment. 7. Scale Issues in Environmental Scenarios Development. 8. Trend Discontinuities and Surprises in Environmental Scenarios. 9. Closing Chapter. As scientists and policymakers try to come to grips with problems such as climate change and risks to biodiversity, they turn more and more frequently to the method of scenario analysis to better understand the future of these problems. Over the last few years scenario analysis has become one of the key tools for bridging environmental science and policy. 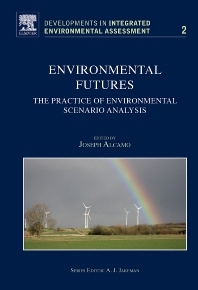 This is the first book to sum up the current practice of environmental scenario analysis and to propose directions for improving its quality and effectiveness. Chapters are written by an international group of distinguished scenario experts and provide an excellent starting basis for first-time scenario practitioners, as well as a collection of new ideas on improving scenario practice for experienced scenario analysts.